Here are our classes for July! Happy Summer! No baby yet, but we do have classes for the month of January! You can view them on our class calendar @ Scraptasia.com, or print them here Download December_2008_Classes. Please call the store to sign up, and for the new year, we are now requiring that you pay at time of sign up. It's a standing policy, but one we are committed to for our New Year's Resolution. Thank you! The October classes are now posted at www.scraptasia.com. 1. Morgan's Fresh Cuts Layout class is on Monday, August 25th (not Thursday as I incorrectly listed on schedule). 2. Make a Stash for it Birthdays - we have added another session on Monday, August 18th @ 7:30 pm. A quick reminder to please call the store to sign up. I do not always see my email timely, and we know how some classes fill quickly! Yesterday was Jessica's birthday. Be sure to wish her a happy one when you call to sign up! 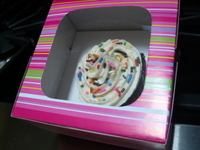 Today I'm sharing a pic of a real cupcake (as opposed to a stamped one ;) A fun way to brighten someone's day, give them their own special cupcake in one of these cutest boxes. I believe you can pick them up at the big bad craft store. I'll share my secret recipe for chocolate cupcakes (or cake)...my tried and true favorite is the one on the back of the Hershey's Cocoa tin. mmm, delish! Buttercream frosting from the Betty Crocker recipe book, and I love using my Easy Accent Decorator from the Pampered Chef to put it on fancy, amateur style.